KAREN BETHEA-SHIELDS received a B.A. in Psychology from East Carolina University. 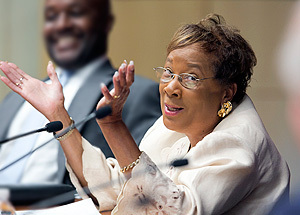 She graduated from the Duke School of Law in 1974 and was admitted to the North Carolina State Bar in 1974. She was admitted to practice in all State Courts in North Carolina; Eastern and Middle Districts of the United States District Courts in North Carolina; and the United States Court of Appeals for the Fourth Circuit. She has been a partner in firms of Paul, Keenan and Galloway; and Loflin, Loflin, Galloway, Leary and Acker. She has represented defendants in serious felony cases throughout her career. She is presently in solo-practice in Durham County. From 1980-1985 she served as the first female District Court Judge in Durham County. During her tenure on the bench she was interested in creative programs that would assist juveniles that are in the criminal justice system. She initiated a program, Probation Challenge, that required probationers, juveniles and adults, to receive their high school diploma or GED while on probation. She has been active in the Durham community as a member of the Homeless Shelter Board of Directors and the Board of Directors for (2) inner city non-profits. She has been a Adjunct Professor at NCCU School of Law. She has taught at NITA and NCADL. She has been a lecturer at NCAJ. She has received numerous awards and certificates. She continues to be interested in programs and organizations that would be of benefit to African American and poor individuals and reduce the mass incarceration that permeates our justice system.